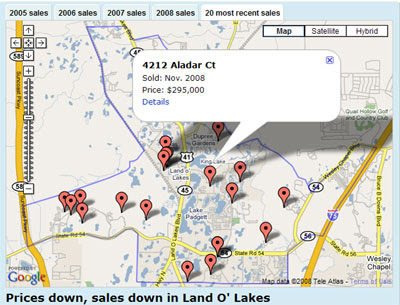 This tool from Tampabay.com has been designed to help people visualise house price and sales trends by county or by neighborhood in the Tampa Bay area. At the moment you can check county trends in Pinellas and Pasco and soon you will also be able to search Hillsborough and Hernando counties. It is possible to search Pinellas or Pasco by zip code or by neighborhood. When you select a neighborhood you are presented with a map showing the last 20 house sales in the area and a written summary of the house trends. It is possible to also view on the map all of the house sales for any year back to 2005.